Richard Marsden is a teacher, writer, and historical fencing instructor from Phoenix, Arizona. I became familiar with his work early this year when I was searching for information on Polish military history. His book, The Polish Saber caught my eye and was immediately dropped into my Amazon wish list. So… dear loyal readers, due expect a review (which many Amazonian’s have listed as a 5-star book) by the end of the year. As I got to know Richard from his Phoenix Society, Facebook page and website, I was certain that he belonged on our list of CombativeCorner interviewees. Without further ado…. 10 Questions with swordsman-extraordinaire, Richard Marsden. 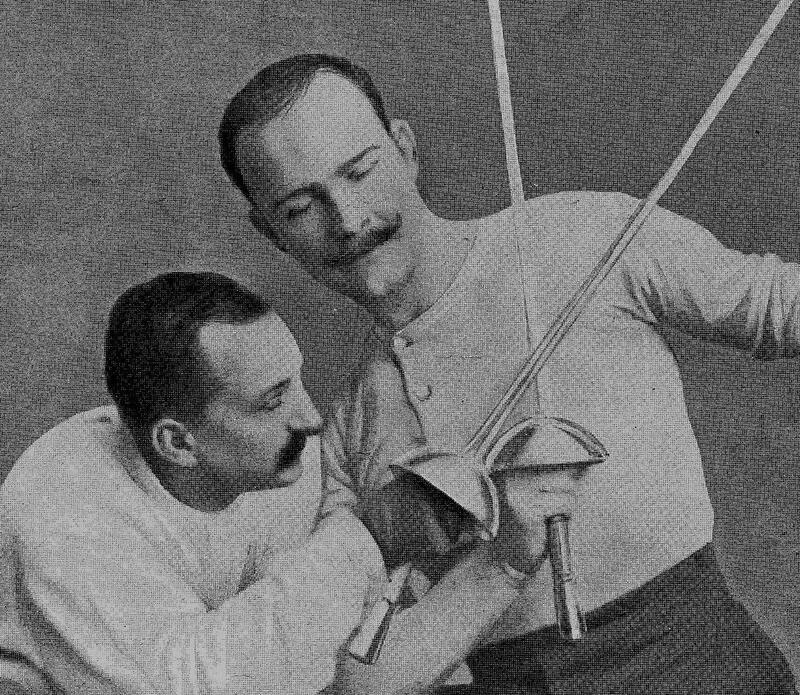 What brought you to the world of historical fencing? At 15, in the 1990s I was dragged by a self-proclaimed Hawaiian Prince, Nick Kalanawani Makai Among to Central Phoenix where the SCA, Adria and other groups met. I was put in Adria and quickly latched onto Greg Hinchcliff who had zero interest in dress up and a huge interest in swordsmanship. We had no manuals, nor did we appreciate them, but we had sideswords and rapiers and learned through fighting. Greg created his own organization, the Loyal Order of the Sword and we fought among ourselves for around 15 years. The group did not die so much as age out, and some of them are in HEMAA today. I even have a tattoo on my right shoulder with the group’s symbol and a custom ring or two. Greg is alive and well and is still the best fighter I have ever known. After the group dispersed I started one at the High School I teach at, and decided to focus on manuals. This was in 2006 or so. As the years ticked by I discovered more and more historical treatises and came across Jim Barrows who taught Italian Longsword at his house. For two years I worked with Jim and around 2011 John Phoenix and I decided to create our own group, the Phoenix Society of Historical Swordsmanship. Today, my group is the largest HEMA group in Arizona, and I have a host of students and instructors, including Jim Barrows, Kyle Cimerian, John Phoenix, Adam Simmons and up and coming Chris Phoenix. My students are many, but my longest is Randy Reyes, who I trust will be a HEMAA certified instructor in no time! What is it about teaching swordsmanship that gives you the most joy? I am a teacher by trade, so I must have a passion for it. My greatest joy is in seeing my students be successful, and better than that, my students’ students. This is now happening, and I feel I have done my job in passing on HEMA to others. Reviving a dead art means we need more people involved, more teachers, more students, and so forth. Small cults, led by a single irreplaceable sensei like figure, do not survive the sensei. I am hoping my cult lives beyond me. I am on a mission to spread HEMA, which is why I ran a High School club, run a large club, attend events, have served for years in the HEMA Alliance to expand services for HEMA, wrote a book, and plan to write more. What principle/concept/exercise do you wish for your students to best understand/practice/embody? All of them in the end. However to start with the simplest. Hit and do not be hit. Make others better when you are better. What is your favorite technique to use in sword fighting? Can you describe how it is executed? Inquartata. In rapier stand with your chest slightly presented as a target. When the opponent lunges, intercept in 4th, while your rear foot swings to the right and your hand flings back. You will then void, intercept and thrust your opponent in a showy display. Agrippa, Capo Ferro, Giganti, Fabris all have variations of it. When it comes to longsword I enjoy using Boar’s Tooth. Fiore spends a great deal of time explaining how to work from Boar’s Tooth and one I like is the deflection. From Boar’s Tooth, have a wide stance, wait for the opponent to strike (make sure they are in measure). As the opponent strikes, the front foot moves a bit left and forward, but does not cross the rear. It’s like going from a wide stance to a narrow. Deflect with the false edge of the sword, batting the opponent’s sword to your right. Pass and cut them. I get fancy and do this from Boar’s Tooth but also Left Woman’s Guard and Left Window. When it comes to Polish saber a cut to the opponent’s right with power, so they parry or get hit. If they parry, then pass while performing a reverse moulinet , where the blade spins backwards, and deliver the tip of the false edge into the opponent’s right wrist. Invitations. Out of measure, or just barely in, strike any pose you want. The Lee Smith vs Richard Marsden saber fight on you-tube shows a couple of those. Should all fencers with a love for historical fencing do HEMA? Why or why not? That is for them to decide. I wave a flag and people come to me, I do not try to push people into HEMA. How important or unimportant do you consider competition? Why or why not? Sparring is important, which is a form of competition. Sparring strangers is important. One teaches application, the other teaches application against the truly unwilling. People who never spar are missing out on a valuable teaching tool. Sparring has its faults, but so do static drills. Competition, such as tournaments are another matter. I have a host of medals, my club has buckets of them. We like tournaments, but we are well aware that they have faults. Tournaments are a good way to showcase one’s skill, meet new people, but also understand that there is a game element to it. There are rules, there are judges, there is a ring, and so forth. Again, like sparring, I think it is a good teaching tool. You wrote a book on the Polish Saber. What brought you to this weapon in particular? Two years later, with international help, the book was made on what we think the Polish saber system of the 17th century on foot looked like. Many instructors feel “A Jack of all trades, a master of none.” What do you feel about this as someone interested in many different weapons? I have enough wins or placements in tournaments in different weapon systems to be a pretty good Jack of All trades, and some of the top performers today are the same. I find that you can’t focus on too much, so I have two or three I work on hard for a time, but I also find that by working with many different weapon systems, even if some for only a few weeks, gives me a greater understanding of HEMA as a whole. Besides, Fiore for example was meant for wrestling, dagger, sword in one or two hands, spear, pole-axe, mounted and more! Rapier treatises show single rapier, but also rapier and cloak, or dagger and so forth. Even inside our systems there are nuances. My suggestion for most is that they consider, longsword, rapier, single-stick/saber/ or sword and buckler at the same time. Each compliments the other, each teaches a specific set of skills. It’s ok to focus heavily on one, but delving into the others may be beneficial. What goals do you have for the near future? Ohhhh you know. Things. A podcast (history), HEMA-centric books, maybe put my Sci-fi novels up as a podcast, possibly another RPG with John Phoenix. More successful students and more HEMAA certifications within the Phoenix Society so one day they can go off and make their own clubs. I have spent a few years on working for others, so I may try to do some catch-up for myself. I need to up my stock portfolio so I can one day pull in a 1000 a month through dividends. I want to visit some places with my family. I’ll be at events for sure, and I’m in hot demand to teach abroad or give seminars, so I’ll work some of those in as well. I’d also like to see the HEMA Alliance continue to grow and support more members and affiliates and certify more people. Maybe I will sit on the dunes of Arrakis and wonder when the sword-messiah will come from the outer worlds. Spend time with the wife! What does Richard like to do with his spare time outside of teaching and fencing? I am a writer, and I do like video games, especially those with immersive stories like the Witcher 3 and GTA V. Here are my publications. You die and come back to life as a fencer from the past (real or fictional)…who is it and why? But your question says if I had to be a real or fictional fencing person who? Stilgar of Dune has a fancy knife, rides worms and gets to be in a long, confusing film, but with great imagery. Syrio Forel from Game of Thrones would be divine justice of a sorts. Teaching… again. Drizzt do Urden has twin scimitars, but… how would I pick anything up, and all that family drama. The Emperor does know how to fight, he is a Master, and I get to rule the galaxy for a bit but then get thrown down a shaft that does not have proper OSHA safety precautions. Solomon Kane, sure I’m dour, but… fighting evil. Fiore lives in a rather violent time and had to kill/wound five men because he wouldn’t share his secrets. I’m not much into really killing or hurting people. Rapier masters all come across as prima-donas and chasing work. Jan Pasek, a cool 17th century Polish noble and swordsman, but a life too filled with drama. So, not for me as much as I love the guy. Alfred Hutton…hmmm, good lifestyle, modern era, interested in HEMA, and seemed happy enough. Maybe him. Maybe a drop of rain? PLEASE FOLLOW COMBATIVECORNER ON FACEBOOK & TWITTER! I was able to catch up with Richard this Dec/Jan throughout his hectic training, touting and traveling schedule. As a fencer myself, and a great fan of sport fencing, I instantly gravitated and quickly grew to appreciate Kruse’s style and patience on the piste. Looking over the internet, I saw that there wasn’t enough information on this guy and many of his previous interviews were short and out-dated. Myself, and all of us at CombativeCorner.Com is glad to have had this chance to catch up with Richard and get a deeper look. I got into fencing through a local club in my neighbourhood in north London way back in 1994. I was trying a lot of sports at the time like karate, football, tennis etc. By sheer coincidence my local club was run by the national Olympic foil coach Ziemek Wojciechowski. As I result I was able to get world class coaching from the very beginning which I attribute a large amount of my success to. Twenty-two years on and my coach and I are still working together. What has been your biggest challenge as a competitive fencer? I can’t say what the biggest challenge of being a professional fencer has been to date. Throughout the years I have encountered many challenges, all of which were problematic in their own right ranging from chronic injuries, to funding, to finding motivation to continue after not qualifying for various championships. All of these issues were difficult in themselves but all managed to get resolved. I’ve always admired your technical style. How have you been able to remain so methodical and “classical” in your approach without fully adopting a “sportive” style? On the issue of my style, I did initially fence in a “sporty style”. Up until 2004 the game was very different due to the more lenient box timings that allowed all flick hits to register. I did actually enjoy that type of fencing a lot but it was fair to say that the game had lost its roots as a sword fighting art. For this reason the FIE made the decision to alter the box timings to allow less flicks and hence restore the character of the foil. This brought about the initial changes to my style. As I’ve got older I am not able to be as physical on the piste as when I was 21 and therefore have to focus more on the technical and tactical side of fencing rather than the athletic side. It should be noted that there were some successful classical fencers back in the late 90s and early 00s at a period when the flick hits dominated the game. The most notable was Piotr Kielpikowski from Poland who retired at in 2002 at the age of 40 after winning a bronze medal at the world championships in Lisbon. In an era when fencers used to run down the piste in foil with their arms back it was refreshing to see someone using the point so neatly. Of course this style does require a lot of skill to function at the highest level so I can see why it’s overlooked by a lot of fencers. Do I think being a tall right hander disadvantages me? Fencing is a bit of a Cinderella style because our competitions are not done in height or weight categories – unlike all other combat sports in the Olympics. This is because you are not actually hitting people with a part of your body and are never supposed to allow your body to come into contact with that of your opponents’. One year you would see an Olympic or World Champion like Lei or Chamley Watson at around 6’5’’ and then next you would get a champion such as Baldini or Joppich that are both well under 6’. Height is no excuse for losing you just have to fence at a distance that is suitable for your body type. The taller fencers will want to keep shorter ones at bay and the shorter fencers will want to fight at a closer range. Being left or right handed is more of an interesting debate in fencing. Clearly there are far more left handed champions than are proportional for the amount of left handers in the population. I’ve heard many theories as to why this is the case, all of which are interesting but the mathematics of the situation is clear. When starting to fence it is likely that a left-hander will practise more against right-handers than vice versa. As a result left-handers will be more accustomed to fencing right-handers than the other way around and therefore they have an advantage. Left-handers at first won’t be so confident against other left-handers but that doesn’t matter because when they both fence you’ll inevitably have a left-handed winner and a left-handed loser. That applies for younger fencers, at the top level you can’t blame a defeat on the handedness of a fencer. You have a tremendous coach in Ziemowit Wojciechowski. How has he helped your game improve? My coach Ziemek Wojciechowski has been of tremendous influence. He has not only produced me but has worked with almost all of the top British Men’s Foilists of this generation. He has single handedly elevated Britain above a third world country in this sport and is a bit of a “John Connor” character of fencing in our country. His enthusiasm for the game is unparalleled and that certainly has rubbed off on me over the years. What specific fencing drills do you enjoy doing and are there ones that you dislike (but need to do)? Specific fencing drills that you do that you like or don’t like. My training mainly consists of a warm up, a half hour lesson and then a few hours of sparring followed by a good stretch-off afterwards. I’m not really too big these days on all the footwork drills that I used to do as a younger fencer. I concentrate more on the technical and tactical game nowadays. Could you explain the most thrilling moment/victory you’ve experienced? My most thrilling victory had to be qualifying for the 2012 Olympics. For a long time it looked like I’d be able to qualify directly off of the world ranking but in the last world cup of the season I was leapfrogged by one world ranking point by Hertsyk from the Ukraine. I thought that was it but it turned out there was a satellite event in Copenhagen the following weekend which would count for Olympic selection. It turned out that if I were to win this tournament then I’d finish just above Hertsyk in the world ranking and get an automatic place in the London Olympics. It was a hard task but I managed to scrape my way through six matches and win the competition. A lot of people asked me why I was so keen to qualify legitimately when Britain had eight “host nation” spots to use in 2012. The truth is that I was told that if I didn’t qualify properly then I wouldn’t be given a “host nation” place. As a result it was crucial to qualify legitimately. What do you feel was your biggest loss, and what did you learn from it? My biggest loss was finishing 4th in the European Zonal event before Beijing. The top three were to qualify for the Olympics and I missed out by the smallest of margins. It was very difficult to find any motivation to finish the season at that point but my coach Ziemek persuaded me to do so. In hindsight I’m pleased he did because about a month before the Beijing Games I was told I’d been given a wild card to compete. As a result of training through the darker times it was possible to go to Beijing and put in a respectable performance. What do you think is important for young fencers to know when they first begin to fence? It is important for young fencers to really enjoy the game. Train as hard as possible and have some achievable goals but at the same time keep other options open for the future. Of course, if you are one of the lucky ones that can be a professional fencer for a living then I’d advise you to take that opportunity! You’ll get to learn a lot about yourself, meet a lot of people and get to travel to all corners of the globe. What does Richard Kruse like to do for fun (besides kicking arse on the piste)? When I’m not fencing I still have a lot of things to keep me busy. I coach twice a week at a local fencing club. I enjoy learning foreign languages which also come in handy with all the travelling we do. Plus I teach the bagpipes once a week at the local scout group. I have a very privileged life as a professional fencer, it has certainly given me the time to explore many hobbies! 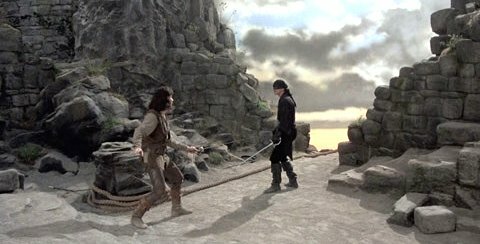 No film has picked up on the atmosphere and realism of the duel quite like Ridley Scott’s 1977 epic film, The Duellists. 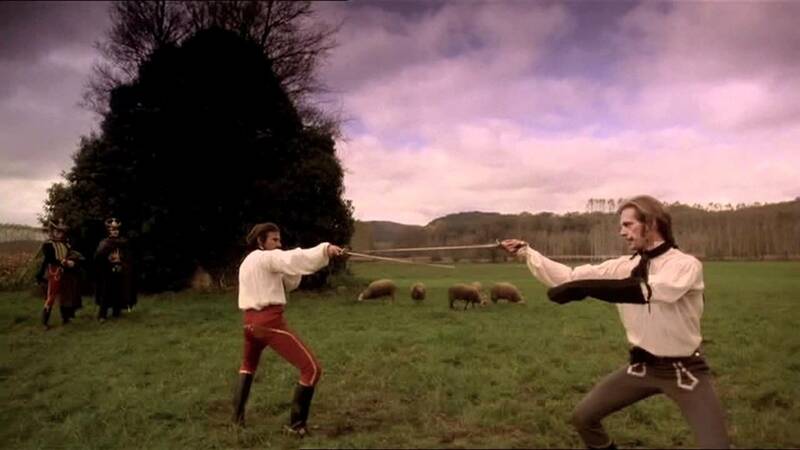 Choreographed by the famous William Hobbs (Excaliber, Willow, & The Count of Monte Cristo) it remains one of the best examples of sword-fighting – especially in this period, (Napoleonic era). What you notice right away by viewing these fight scenes, is that the intention and awareness is focused on his opponent (remember, your life is on the line). Two, each fighter is hesitant on making a non-calculated action until there is a need to react to something – something that you possibly did not expect. And third, the fight scene is extremely short. Many duels started and finished in the time it took to read this paragraph. * Cutting with a sabre often produced gaping wounds, but it was the thrust (often w/ dueling sword, smallsword or rapier) that was fatal. *Keep in mind that once the actual sword-fighting starts, depending on the skill, fighting area, luck, etc., duels could last anywhere from seconds to several minutes. Most duels didn’t last more than 10 minutes. But think of the amount of stamina that that would require! Needless-to-say, if you are serious about sword-fighting, be ready for anything. It is of my opinion that if you can’t fight well against one person, you can’t and won’t perform well in a skirmish/battle. It is very important that you first learn your weapon (or weapon set) & build your skill. This includes Guard positions, techniques and movement tactics (learning first solo, then one-on-one and then (perhaps) multiple opponents). >Bruce Lee once said, “One does not accumulate but eliminate. It is not daily increase but daily decrease. The height of cultivation always runs in simplicity.” This quote can easily be understood by the experienced martial artist – but is often hard for the beginner. Learn your techniques, various ways of movements…be a scientist of the martial sciences and put your skill and techniques to the test in competition. What techniques serve you the best? Which ones keep you safe or make you harder to hit/counter? Keep them. Discard those techniques that put you in a bad position, are too flashy or complicated. Find your personal “Go-To” techniques. The mindset, especially in training and mock-dueling is essential. It must be centered around one thing – never allow a single touch. And if a touch is received, never allow a second. Always make it hard for your opponent to attack, find steady footing, or catch a breath. Use your environment, training and your intelligence in sword-fighting to be victorious. Victory favors the skillful! I tell my young students, “Imagine you stepped back in time… You encounter a villainous foe, and he corners you into a fight; a fight to the death!” In an act of self-preservation you grab firmly your weapon of choice and ready yourself for any oncoming attack. 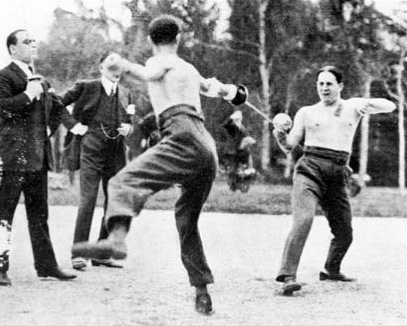 In all matters of self-defense, I think it is fair to say “Anything goes.” This may include acquiring another weapon, kicking sand, or dirtying your point (in hopes that the doctor or director halts the bout, thus giving you a needed breather). However, under normal circumstances and in hopes of winning honorably… I find it best to train using solid (go-to) techniques and spar using great sportsmanship. Ultimately, if one had the liberty of choice (in dying), most would choose the honorable over the cowardly. At least one would hope. I know there are many fencers and historians out there that might have some a different idea or opinion towards duels and/or what I have written. If you would like to offer any comments, critiques, or possible revisions/errors, please let me know by leaving a comment and I will review and take them under heavy consideration. Thank you!